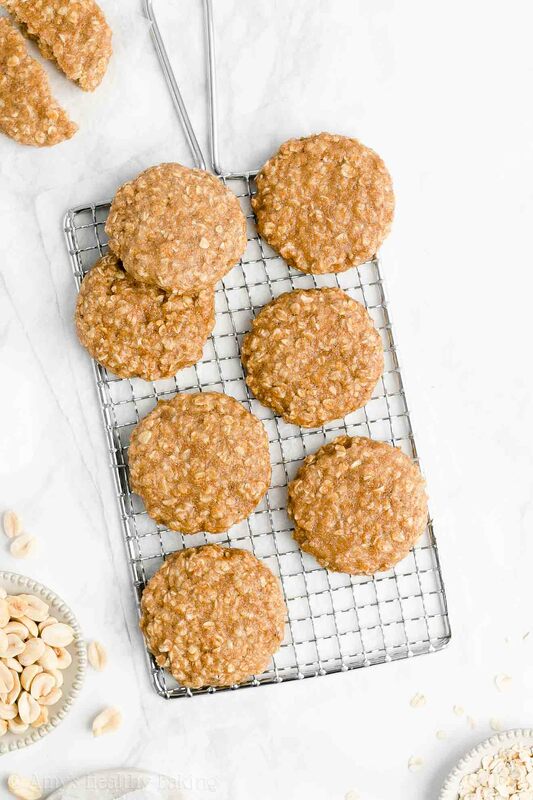 Learn how to make these healthy peanut butter banana oatmeal breakfast cookies from scratch! No mixer required, and they’re perfect for meal prepping or quick grab-and-go snacks! Only 73 calories with no butter, oil, eggs, refined flour or sugar! During my senior year of high school, our marching band director planned our winter trip for mid-December, rather than during our two-week break at the end of the month like usual. He set up a parade through Disneyland on a Friday, as well as a field show competition at a Southern California high school the following day, and arranged for us to drive back on Sunday. So we missed as few classes as possible, we met in the band room shortly after midnight on that particular Friday, and we loaded our suitcases and instruments onto five big charter buses. Before the clock struck one, we were on the road, with an estimated arrival time at Disneyland of just before 8 am. Almost everyone tried to sleep during the drive, including myself… Yet I’ve never been able to sleep well anywhere except a bed, and especially not in moving vehicles like cars, buses, and airplanes. I only managed a couple of hours, and by the time the sky started to turn a faint rose hue, I was already wide awake and staring out the window at the limited number of cars speeding past. When we reached the theme park, my stomach was growling almost as loudly as a lion. I desperately needed breakfast—preferably something sweet and portable that I could devour while running around Disneyland and trying to fit in as many rides as possible before heading backstage to change for the parade! Our band managed to pass through the park gates as one of the first big groups, which meant we found zero lines at any of the concession stands and rides. I slipped into the first place I saw, a bakery on Main Street, and grabbed a banana muffin for my first meal of the day. 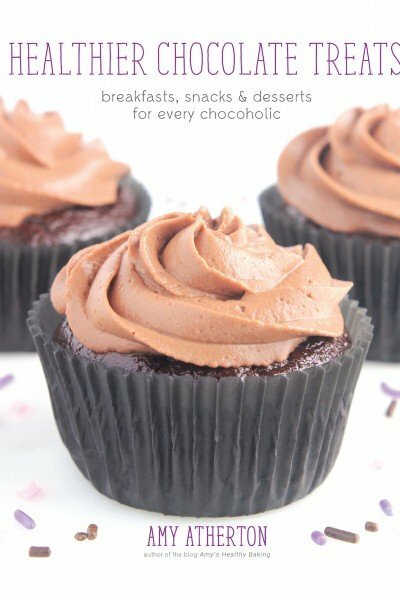 Although it tasted delicious with its incredibly moist and fluffy texture, it was almost more like a cupcake than a breakfast item with how much oil and sugar it contained… And I felt myself on the verge of a sugar crash just a couple of hours later. However, these Healthy Peanut Butter Banana Oatmeal Breakfast Cookies would’ve been a much better option! They’re so soft and chewy, just like regular “dessert” cookies, with the perfect blend of sweet fruit and comforting peanut butter flavors. Yet these healthy breakfast cookies contain no butter, oil, eggs, refined flour or sugar… And just 73 calories! With how great they are for meal prepping and quick grab-and-go breakfasts or snacks, they definitely would’ve been the perfect breakfast for that morning in Disneyland! 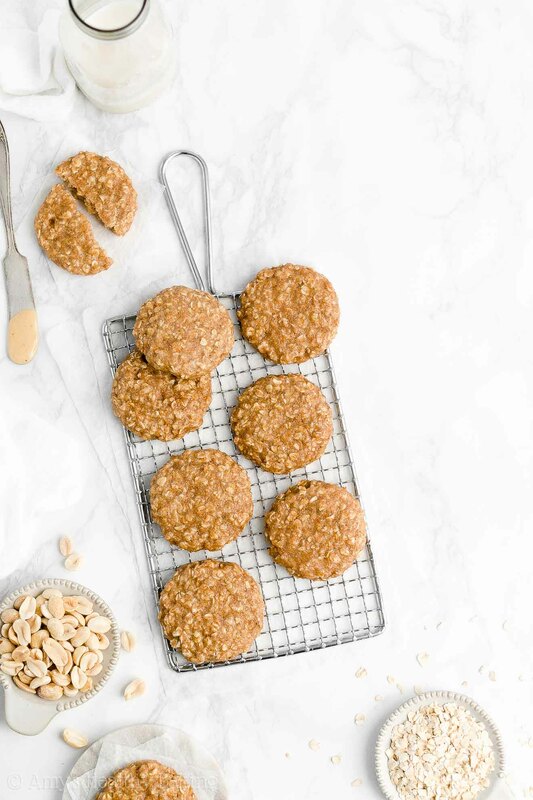 So let’s go over how to make these healthy peanut butter banana oatmeal breakfast cookies! You’ll start with a combination of whole wheat flour and instant oats, along with a touch of cinnamon (this kind is my favorite!). 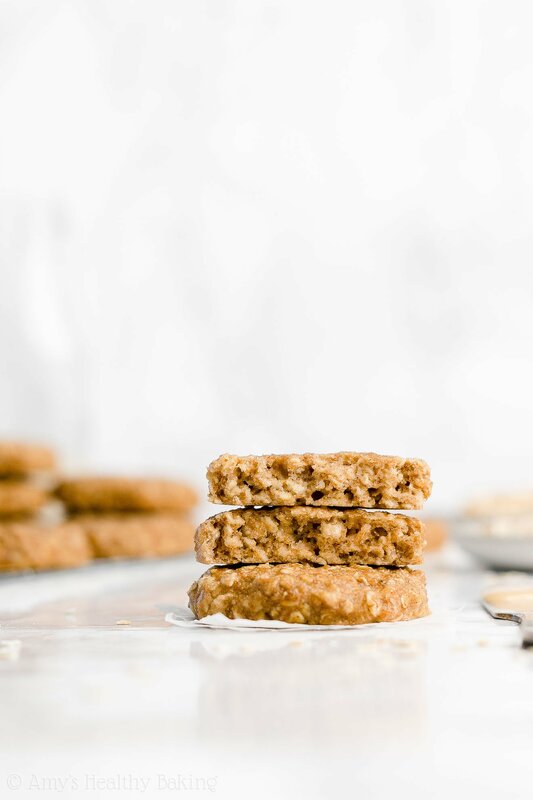 It just feels wrong to make oatmeal cookies without a sprinkling of cozy spices… And even though peanut butter + banana + cinnamon might not be the most intuitive combination, it works surprisingly well. 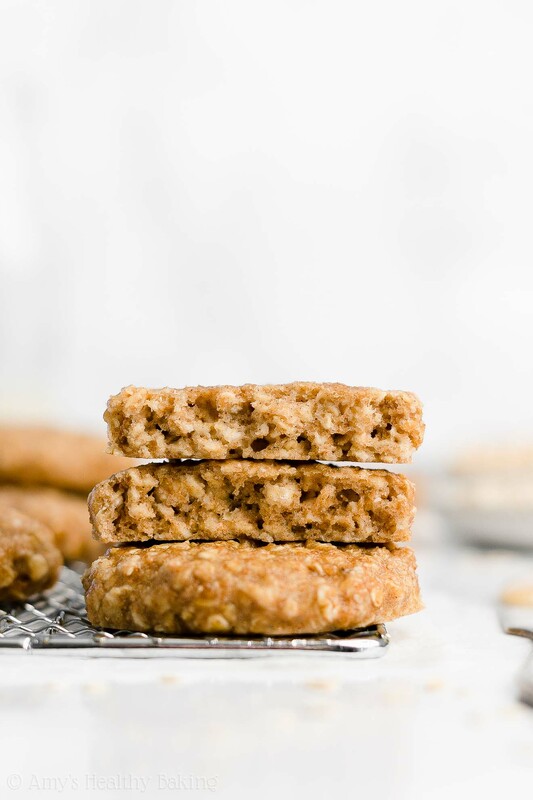 These healthy peanut butter banana oatmeal breakfast cookies taste incredible! 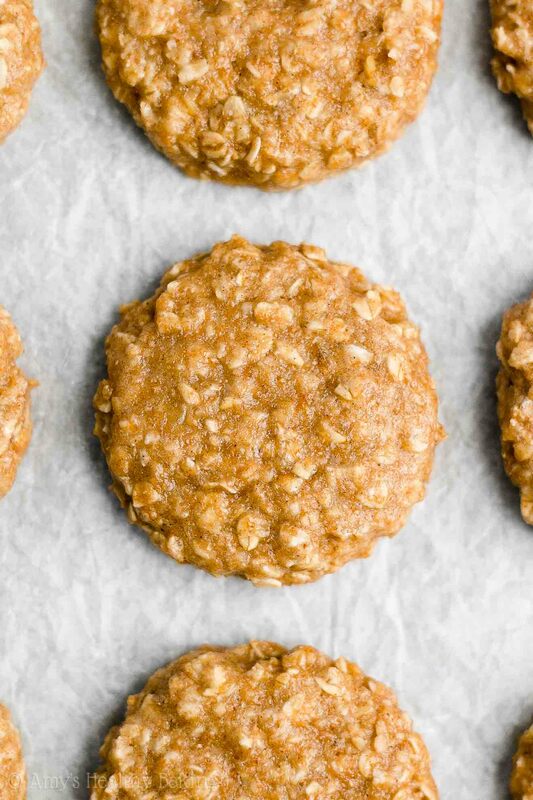 As for the instant oats, they’re not the kind sold in those individual brown paper packets with flavors like “apple cinnamon” and “maple brown sugar.” They’re just smaller and thinner than old-fashioned rolled oats, which means they soft and cook faster… Which leads to the most irresistible soft and chewy texture in your healthy peanut butter banana oatmeal breakfast cookies! Tip: You can almost always find canisters of instant oats right next to the old-fashioned rolled oats at the grocery store! Just remember… It’s extremely important to measure the oats and flour correctly, using this method or a kitchen scale. (← That’s the one I own and love!) Too much of either will dry out your cookie dough and make your breakfast cookies cakey or dry, rather than soft and chewy. This is especially true of the oats because they act like little sponges and soak up as much moisture as they can! Tip: If you use a kitchen scale like the one I have, then you usually end up with fewer measuring cups and dishes to wash after baking. 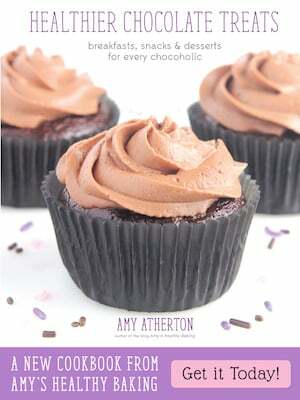 It also ensures your treats turn out with the perfect taste and texture every time you make them. My scale is my all-time favorite kitchen purchase! Next, you’ll stir together mashed banana, homemade creamy peanut butter, and vanilla extract. This is my homemade creamy peanut butter recipe. You just need 5 minutes and a blender to make it! 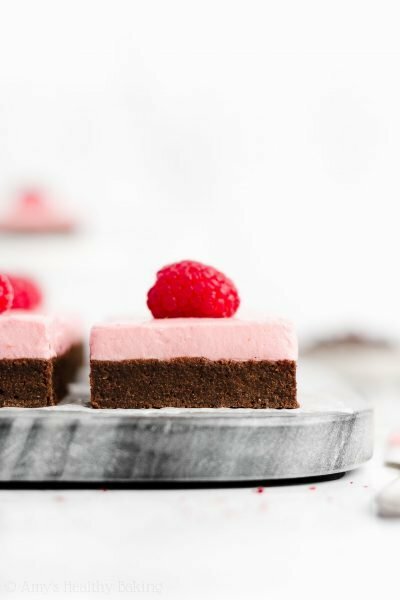 It has such a lovely velvety texture, and it tastes so much better than most of the store-bought varieties. 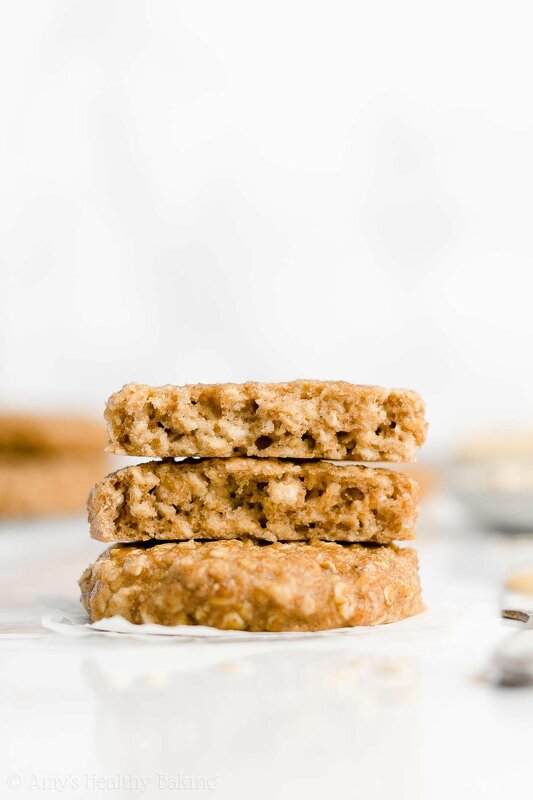 The mashed banana actually plays three roles in these healthy peanut butter banana oatmeal breakfast cookies! It provides flavor (obvious, I’m sure! ), replaces the eggs (hooray for healthy egg-free and accidentally vegan breakfast cookies! ), and adds natural sweetness. For the best flavor and sweetness, use the ripest bananas you can find. Bananas that are pure brown or black are perfect! These ones contain more natural sweetness and a stronger flavor than their pure yellow cousins. 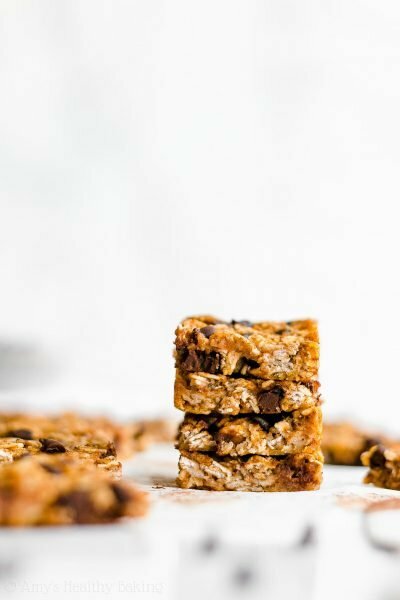 If you use overly ripe bananas, you’ll end up with the best healthy peanut butter banana oatmeal breakfast cookies imaginable! 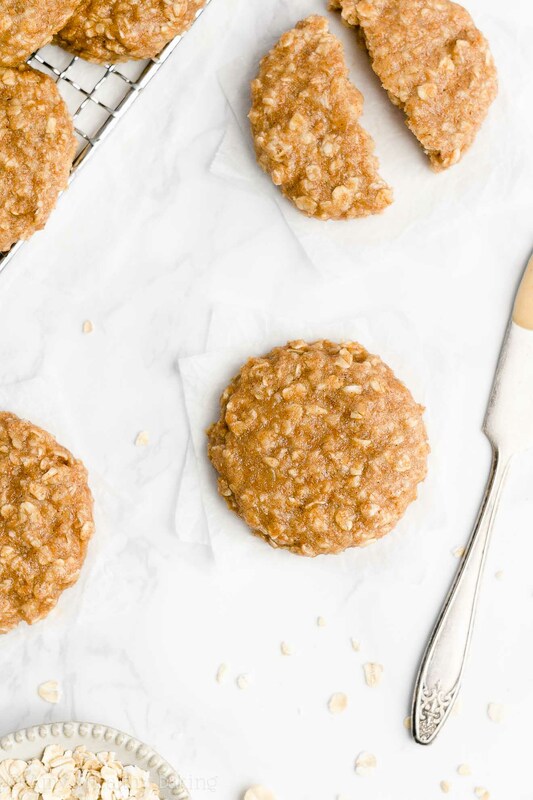 To make sure these qualify as healthy breakfast cookies, you’ll use only half the amount of pure maple syrup compared to regular “dessert” cookies. Skip the pancake syrup and sugar-free syrup! 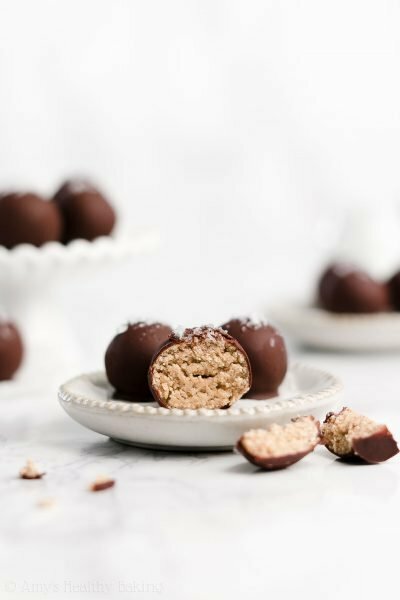 Those contain refined or artificial ingredients, which we’re avoiding in this healthy recipe. You want the kind that comes directly from maple trees! The only ingredient on the label should be “maple syrup,” and it generally comes in thin glass bottles or squat plastic jugs (like this!). 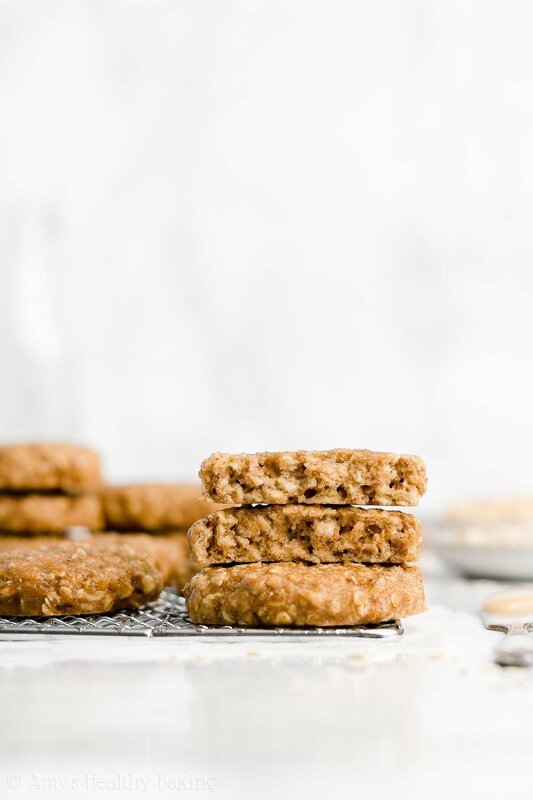 Bonus: By using unsweetened almond milk, your healthy peanut butter banana oatmeal breakfast cookies are completely dairy-free and vegan! When you first stir together the cookie dough, it’ll be somewhat wet. However, there’s an easy fix… Pop it in the refrigerator! Yes, chilling is mandatory. Chilling stiffens the cookie dough and gives the oats some time to absorb moisture, which helps them soften. It leads to extra soft and chewy healthy peanut butter banana oatmeal breakfast cookies! Once you’ve dropped your cookie dough onto your baking sheet (I always line mine with one of these silicone baking mats! ), remember to flatten your cookie dough using a spatula. (These spatulas are my favorite!) 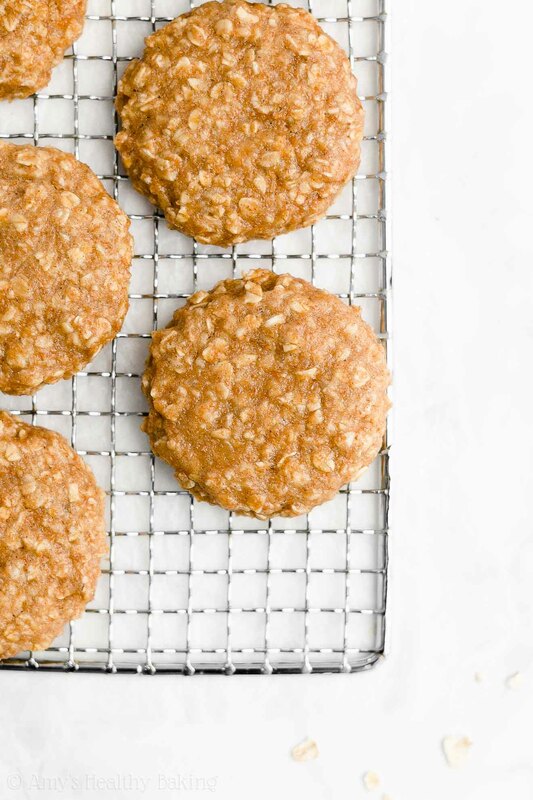 This cookie dough doesn’t spread while baking, so by flattening it, your healthy peanut butter banana oatmeal breakfast cookies will look like normal cookies, not round dough balls! Tip: One of the most common questions people ask me is “How do you make your cookies look so round and perfect?” No big secrets here… Just a mini spatula and lots of patience! I just slide blobs of cookie dough onto my baking sheets with a spoon and my favorite mini spatula, and I spend 10-15 minutes flattening and shaping the edges of the cookie dough with that same spatula to make it look round. That’s all! Enjoy your healthy and delicious breakfast cookies! And when you make your own, remember to snap a picture and share it on Instagram using #amyshealthybaking and tagging @amyshealthybaking IN the photo itself! (That guarantees I’ll see your picture! 😊) I’d love to see your healthy peanut butter banana oatmeal breakfast cookies! These breakfast cookies are supremely soft and chewy, just like regular cookies! They have lots of hearty oats along with plenty of sweet fruit and comforting peanut flavors. They’re great for meal prepping or quick grab-and-go snacks, and they also freeze well! Leftovers will keep for at least one week if stored in an airtight container in the refrigerator—if they last that long! In a medium bowl, whisk together the oats, flour, baking powder, cinnamon, and salt. In a separate bowl, stir together the banana, peanut butter, and vanilla. Stir in the maple syrup and milk. Add in the oat mixture, stirring just until incorporated. Chill the cookie dough for 20 minutes. Preheat the oven to 325°F, and line a baking sheet with a silicone baking mat or parchment paper. Using a spoon and spatula, drop the cookie dough into 15 rounded scoops onto the prepared sheet. Flatten to the desired thickness and width using a spatula. Bake at 325°F for 9-11 minutes. Cool on the pan for 10 minutes before turning out onto a wire rack. Notes: It’s extremely important to measure both the oats and flour correctly using this method or a kitchen scale. (← That’s the one I own and love!) Too much of either will dry out the cookies and leave them cakey or dry instead of chewy. For the gluten-free flour, I recommend the following: ½ cup (60g) millet flour, 2 tablespoons (15g) tapioca flour, 2 tablespoons (15g) brown rice flour, and ½ teaspoon xanthan gum. Most store-bought gluten-free flour blends (like this one!) will also work, if measured like this. Instant oats are also known as quick-cooking or minute oats. They're smaller and thinner than old-fashioned rolls oats. They come in large canisters, just like old-fashioned oats. They are not the ones in the small flavored packets of oatmeal. 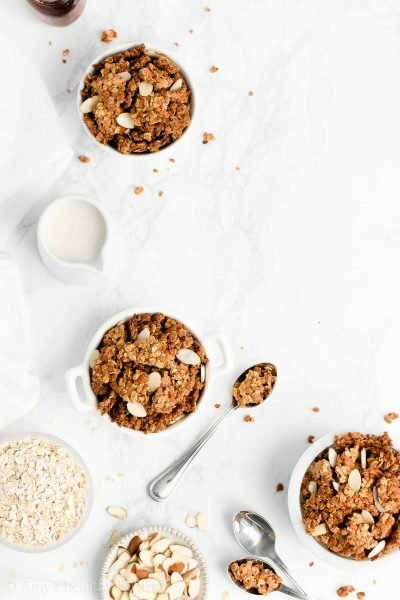 To make your own, add the same amount of old-fashioned rolled oats to a food processor, and pulse 10-12 times or until the oats are about ¼ to ⅛ of their original size. Use the ripest bananas you can find! Ones that are pure brown or black are ideal. This is because pure brown or black bananas contain more natural sweetness, a stronger flavor, and a better texture than yellow bananas. This is my favorite homemade creamy peanut butter recipe. You just need 5 minutes and a blender to make it! If using store-bought creamy peanut butter, make sure it only contains peanuts and salt—no other ingredients. It should be liquidy at room temperature. Do not substitute crunchy peanut butter. For a stronger peanut butter flavor, increase the homemade creamy peanut butter by 1 tablespoon (16g) for a total of 3 tablespoons (48g) of creamy peanut butter. Any milk may be substituted for the unsweetened vanilla almond milk. For answers to all other questions regarding substitutions and tips, see my Oatmeal Cookie FAQ page. 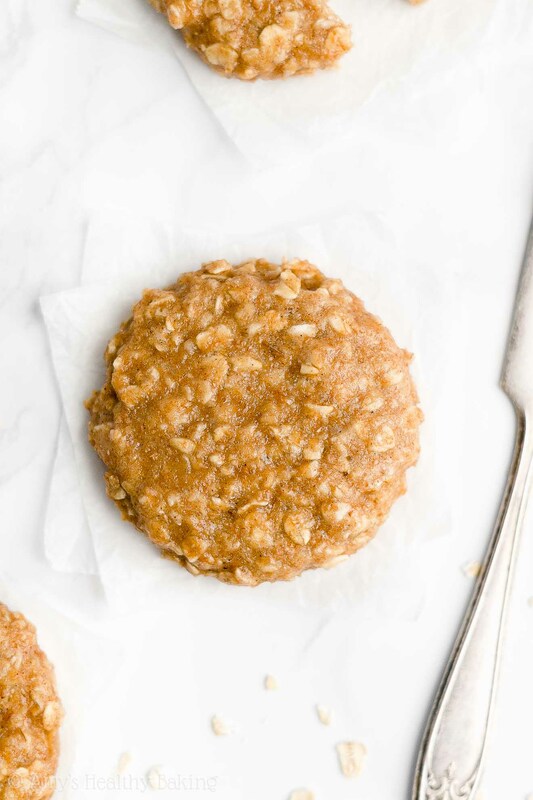 ♡ …and the rest of Amy’s healthy oatmeal breakfast cookie recipes! These look delicious! I didn’t see this listed in the FAQ section but could you substitute almond, cashew, or even sun butter for the peanut butter? I really appreciate your interest in my recipe Cindy! As long as those options are the natural drippy-style kind (aka they only contain almonds + salt, cashews + salt, or sunflower seeds + salt), then they should work just fine in place of the peanut butter. 🙂 I’d love to hear what you think if you try these breakfast cookies! Hi Amy, What do you think about me using frozen/thawed bananas? Thanks! I’m honored that you’d like to try this recipe Dawn! I haven’t tried using frozen and thawed bananas in these breakfast cookies before, so I’m not sure. However, if you’ve been able to use them to make other cookie (or granola bar or muffin!) recipes, then I think that should probably work here as well. 🙂 I’d love to hear what you think if you try these breakfast cookies! These look absolutely delicious! I will also be trying your hot cocoa recipe! Thanks so much!